To get your creative juices flowing for the Bloggers' Dinner Party, I wanted to share a roundup of napkin tutorials and inspiration! Napkins are a great project - quick and easy, they are a fun way to show off a favorite fabric, try out an embellishment technique, or just keep it simple with a beautiful solid. 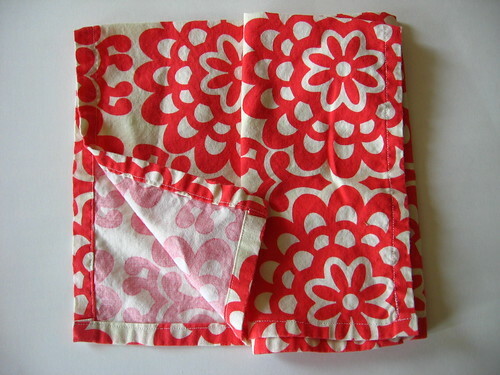 We pretty much always use cloth napkins at our house, and in addition to a number of store-bought sets, I have a few fun sets that I made myself which we mainly use on our patio (with our bright red melamine target plates). Both of these sets of napkins are made with a very basic technique, just starting with a square of fabric and then folding and ironing the edge over 1/4 - 1/2" twice and then stitching the edge in place - pretty much using the second technique in this skip to my lou post. I started with fabric squares about 21-22" square, which is basically the largest you can cut them and fit two across the width of fabric - so with 1 and 1/4 yard of fabric, you can get 4 napkins. In addition to your choice of fabric, you can spice these up a little by using a fun contrasting thread color. For really quick everyday napkins, if you have a serger you could make napkins with a serged rolled hem, as shown in this video tutorial on Sew Mama Sew. Sew Take A Hike has a fun tutorial for colorful linen napkins with a wider contrasting edge with mitered corners - which she accents with embroidery stitches, too. I think this would look great either with or without the embroidery! 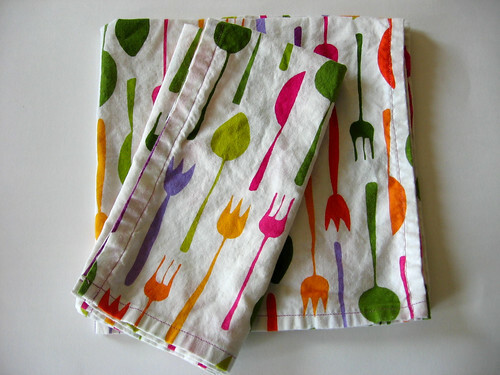 Sew4Home has some really cute napkin tutorials too, including the Italiano Kitchen Bistro napkins with a fun fabric band (above), and their Citrus Holiday Easy Napkins which have a fabric border at one end. How about you - have you made napkins before? What is your favorite napkin technique or tutorial? 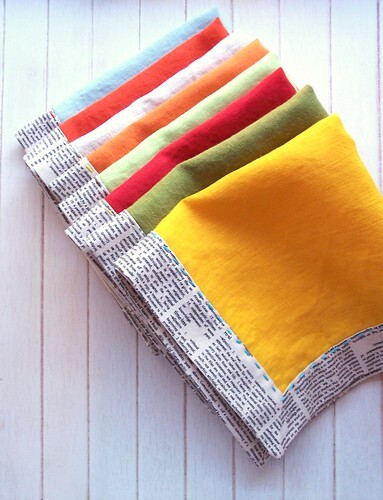 I hope you are feeling as inspired as I am now to whip up some fun cloth napkins! Don't forget to link up with this month's Bloggers' Dinner Party for a chance to win a great fat quarter bundle from Sew Fresh Fabrics! What a terrific post -- hopefully I'll make some of these beauties in a few weeks. terrific post, Kate! Thanks for the shout out! Just last week I made a napkin with mitered corners using the tutorial at Prudent Baby. Thanks for the additional resources.